I’m sure you could give me more and more reasons to read. But it is that last reason, about connecting, that interests me today as I write to you. That post on twitter with 12 reasons to read? One of the reasons was to “know that we are not alone.” I can’t think of anyone who has ever said that to me. But I think if we stopped for a good while and gave thought to why we read, we would be able to express for ourselves that reading connects us to other people. And it is in that connecting and relating to other people, that we recognize and appreciate those things we have in common with others, as well as our differences. It brings us a measure of comfort to discover our own uniqueness, as well as seeing that other people often think and choose and behave in the world in much the same way we do, as they encounter similar life circumstances that become part of our daily living. Indeed, we are not alone…and books introduce us to people and places and events that make up this ever-changing world around us. Plus, with a book you do have some say in the who, what, where you are getting introduced to! Need a new book to feel connected, or for any other reason? Come see us. Need a REALLY new book? 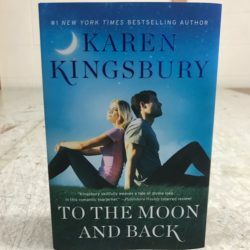 Tuesday, May 29th was the release date for the new Karen Kingsbury book titled “To The Moon And Back.” We can certainly recommend Ms. Kingsbury to you, as well as many other authors whose writings will give you plenty of reasons….to read!